Know your body. What's your first symptom? For me, it's itchy ears. For my husband, it's a sour taste in his mouth. For someone else it might be fatigue or loss of appetite or slight sinus pressure, etc. The list of possibilities is long, but if you pay attention to your pattern when you get sick, most people have an identifiable first symptom. Once you know what yours is, you can act! Don't ignore it. You need to act immediately to prevent illness. Waiting even one day will usually be too late. Focus on nutrition. Give your body the tools it needs to stay healthy. Skip the sugar and increase your nutrient-density. A great recipe would be Chicken Liver Fried Rice. Don't skimp on sleep. People who sleep less than 7 hours each night are 3 times more likely to catch a cold than people who sleep more than 8 hours per night. (Source). Have some garlic. Both the common cold and the flu are viruses, and garlic is a potent anti-viral. Chop up a few cloves and let them sit for 10 minutes to release the allicin before cooking with them. Allicin is the medicinal compound, and heat prevents it from forming. However, once it has released, it stands up to heat, so add it to a cup of bone broth or stir it into any recipe, like this one: Kale with Garlic and Cranberries. Caution with supplements. 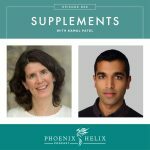 Studies show that some supplements like elderberry and echinacea can potentially reduce the duration and severity of illness when taken at the first sign of symptoms. However, since these supplements also stimulate the immune system, they also have the potential to stimulate the autoimmune response. For that reason, I don't recommend them for people with autoimmune disease, unless you know you tolerate these supplements well. Sometimes a cold or flu is inescapable, no matter what we do to try to prevent it. It's happened to all of us, and it's definitely not fun! Thankfully, there are things we can do to soothe ourselves while we heal. Sore Throat – Drink hot water with lemon and honey. Warm liquids are soothing to the throat. Lemon is an astringent that helps shrink swollen throat tissue; it's also a natural antiseptic and rich in vitamin C. Honey not only coats the throat but is also a natural anti-inflammatory. 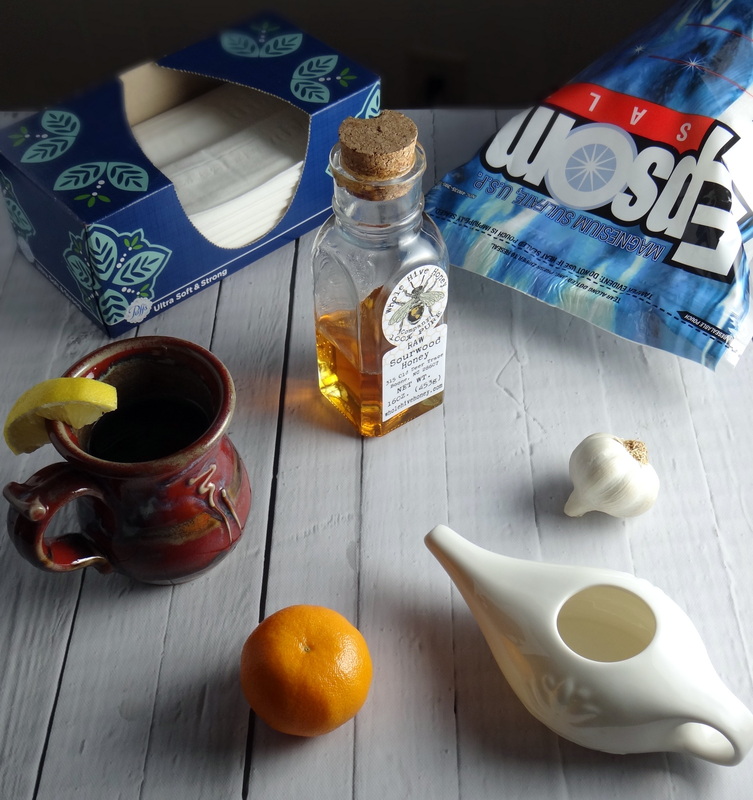 Cough – Honey to the rescue again. Research shows that honey is superior to cough medicine in reducing symptoms and helping children get a good night's sleep. That goes for adults, too. You can slowly savor a teaspoon of raw honey, or make your own homemade honey cough drops. Just make sure it's raw honey; commercial honey doesn't offer the same benefits. For stronger congestion that honey doesn't alleviate, try this petroleum-free vapor rub. You can also make your own. Runny or Stuffy Nose – A runny nose is your body's attempt to remove the virus from your nasal passages. Blow your nose regularly to support this process. A stuffy nose happens when there is more mucus than your body can process. Have you heard of a Neti Pot? 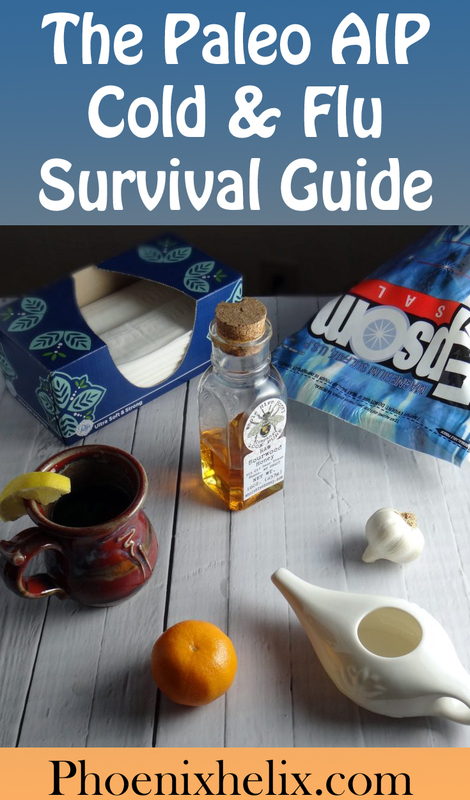 This simple tool allows you to do a salt water rinse of your nasal passages, which removes excess mucus, alleviates the pressure and supports your body's natural healing process. This can also help prevent sinus infections. Sinus Pressure Headache – When you have a cold, it's common to feel pain and pressure in your head, particularly focused around your eyes and cheekbones. That's because you have sinus passages inside your skull that are connected to your inflamed nasal passages. One thing that's quite soothing is a cool washcloth over your eyes and cheekbones. You can also buy a gel ice pack designed specifically for this purpose. Raw, Chapped Skin – This often happens around the nose when we've been blowing it for a few days. 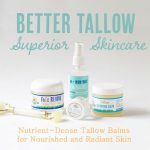 Tallow is a deeply emollient, natural moisturizer that quickly replenishes severely dry skin. Aches/Chills – This is your body trying to raise its body temperature without resorting to a fever. Give it a hand by taking an Epsom Salt Bath. Add 1-2 cups of the salt to a full bathtub of warm water, and enjoy. The steam will help clear your nasal passages. The heat will help kill the virus. The salt is naturally detoxifying and often eliminates those body aches. It's also very relaxing and promotes sleep. Nausea – Ginger is famous for it's ability to soothe nausea, and as an added bonus, it's also anti-inflammatory. Here's a simple recipe for Homemade Ginger Tea: Bring a cup of water to a boil, add 1 teaspoon minced or grated fresh ginger, simmer for 5 minutes. Strain into a mug and add a little raw honey, to taste. Fever – If your body has activated a fever response, it is trying to use your raised body temperature to kill off the virus. This is a good thing. If you can sleep it off and just let your body do its work, that's ideal. But if you have autoimmune disease, you also need to be cautious. Call your doctor if your fever goes above 102 degrees. Cabin Fever – When cold symptoms are mild we can still get outside, but if they become severe, we're usually laid up on the couch for a few days. It can get depressing! If you have a bright sunny window in your house, try to curl up there. If not, try a light therapy box. Sunshine releases endorphins – the happy hormones in our brains, and research shows that light therapy boxes with 10,000 lux have the same effect. This is why people often get depressed in the winter with shorter days and more cloud cover. Sleep Comfort – Sleep is essential to healing. That is when our bodies are repairing and regenerating, and that's why colds and flus make us feel so tired. Our bodies are sending us a signal to get more sleep. The challenge is that this can be hard when we're uncomfortable. All of the tips I already shared above will have the added benefit of helping you sleep, but here's one more: Elevating your head with an extra pillow can help minimize coughs, sinus congestion and headaches. 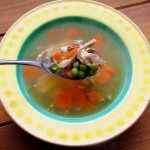 Foods that Support Healing – There's a reason homemade chicken soup is the food we crave when we're feeling under the weather. It's full of nutrition to help our bodies heal, it's easily digested, and research shows it has medicinal benefit. Avoid creamy soups when you're sick, because they can increase congestion, whereas clear broths help to clear it. If you develop nausea or a fever and lose your appetite, there's nothing wrong with fasting for a few days. Once your appetite starts to return, begin with some simple bone broth. If that goes well, progress to soups and stews. Some other simple foods that can be soothing to a sick body are applesauce, homemade jello, and fresh-pressed citrus juice (which is high in vitamin C). Stay Hydrated – Cold and flu symptoms are designed to eliminate the virus from your body, but a common side effect is dehydration. Drink plenty of water, and if you have diarrhea or vomiting, you'll want to replenish your electrolytes as well. Coconut water is a natural electrolyte drink you can buy, and here's a recipe for a homemade electrolyte drink. Remember that cold symptoms have a purpose. While they are uncomfortable, they are your body's way of eliminating the virus. Focus on what's improving. There is a pattern to a cold where one symptom disappears and another arrives. Celebrate each one that passes and know that you're heading toward wellness. Do a body scan meditation. Sometimes when you're uncomfortable, your attention is 100% on the painful symptoms and you don't notice anything else. This can make you feel worse. For me, when I have a cold, it's like I'm living in my sinuses. All I feel is the pressure in my head, but if I just expand my focus beyond that for a moment, I immediately feel some relief. Body Scan is a guided meditation that sends your attention on a non-judgmental journey throughout your entire body. You will be surprised to discover how much of your body feels good, even when you're sick. Dealing with feelings of fear. When you have autoimmune disease, catching a cold or flu comes with higher risks. There is a higher chance it will progress to an infection. There is also a chance it will lead to a flare. Fear can actually increase the stress response and therefore make negative outcomes more likely. 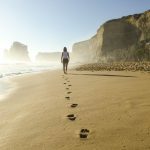 There are two techniques that are very helpful to get a handle on our fears and restore a feeling of peace, even in the midst of illness. Emotional Freedom Technique and Byron Katie's The Work. Is your congestion clear or is it green/yellow? The cold and flu produce clear congestion. Yellow/green mucus might mean an infection. Are you experiencing chest pain? Is it becoming hard to breathe, like your lungs are working against a weight? These are possible signs of pneumonia. Do you have a fever higher than 102? If yes, it's worth seeing a doctor. Has your “flu” lasted more than a few days? If yes, call your doctor. Do you have an earache or toothache alongside your stuffy nose? These are possible signs of a sinus infection. Do you suddenly have bad breath? This is another possible sign of infection. Do you have a sore throat and a fever at the same time? That can indicate strep throat. A cough, on the other hand, rarely coincides with strep throat. Is it a Cold, Flu, or Pneumonia? I'm not a doctor, so this article isn't a substitute for medical advice. This is simply support and information shared among friends. Always consult your doctor with medical questions. Here's to good health!